Maghreb Blog: Firebrand Rapper Arrested in Morocco...Again. Firebrand Rapper Arrested in Morocco...Again. Morocco’s revolutionary rapper, Mou’ad Belghouat, is arrested again. After a year in jail for fictitious charges, El Haqed (the Indignant) was arrested Sunday outside Mohammed V Stadium where his favorite Raja de Casablanca football club was to play arguably one of its important matches of the season. Like any football fan in Casablanca, El Haqed, with his brother and friends, was strolling into the stadium when he was arrested by police officers for scalping tickets in the black market. This is hardly an offense in any world stadiums, and is a vindictive trumped-up charge to settle scores with a virulent critic of the regime and state. “As soon as he [El Haqed] got to the gates with his brother and his friends, police approached them and immediately targeted Mouad [ElHaqed]. One officer made it clear that he needed to settle something with him. Police then accused him of buying tickets from the black market, and proceeded to beat him and his brother into submission when he objected and denied their allegations. They cuffed him shortly after and took both brothers, while allowing their other friends with the same regular tickets to run. “It looked as though it was premeditated, they acted as if they’d already planned to brutally assault us both at first, arrest us, take our belongings, beat us some more, then keep Mouad in custody”. Hamza continued to describe the situation as an appalling and humiliating experience: “They hurt him badly in his hands, I saw the marks… they dragged us into one of those blue police vans and beat us even more. The aftertaste is always horrible. They insulted us and attacked us for five hours during the interrogation. It was so humiliating. They took my smartphone, then took us to the 15th (name of one of the police stations in Casablanca). They then kept my things, let me go, and kept Mouad locked up”. 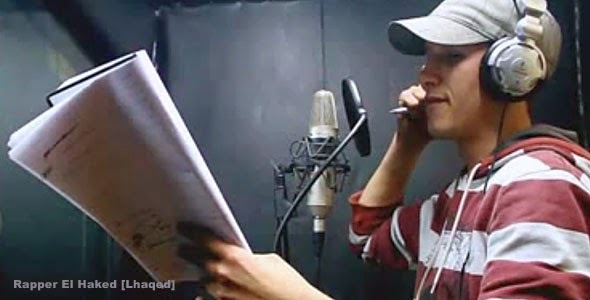 Since the release of his album, El Haqed is said to have been waiting for the state’s retaliation, and it is hardly a surprise that the forces of order would seek the most repugnant ways to silence an artist in his quest to express the frustrations of many of his generation. Italian filmmaker Federico Fellini once said: “Censorship is advertising paid for by the government.” Harassment of El Haqed will certainly further highlight his songs and lyrics. His latest album “Walou”, available in its entirety on YouTube, will garner much wider appeal and viewership now that he is prosecuted by the state. Authoritarian states still do not fathom that muzzling dissident voices only amplify their message in the most poignant manner. It also provides a focal point for increased protests and opposition to state authority. The latest arrest of El Haqed further highlights the setbacks that Morocco has undergone since the passage of the much-heralded new constitution of July 2011. A constitution that was promulgated after the initial sparks of the Arab uprisings, and supposedly guarantee freedom of speech, including artistic expression, and journalistic independence. The Moroccan authorities have effectively lost the compass in recent months clamping down on all vestiges of individual freedom, especially those that are critical of its structures and policies. Journalist and fierce critic of the state, Ali Anouzla, is still in prison waiting for trial for ludicrous charges of supporting terrorist groups. The state is flexing its muscles after the failure of the protest movement to mount a significant challenge to the regime. Increased state confidence is palpable in its unjust and shameful treatment of dissident voices. The State ought to tackle real issues of concern to Moroccans, the same issues that are treated in El Haqed’s lyrical diatribes, and Anouzla’s incisive columns. Instead, the authorities seek to silence, the bearers of those messages.